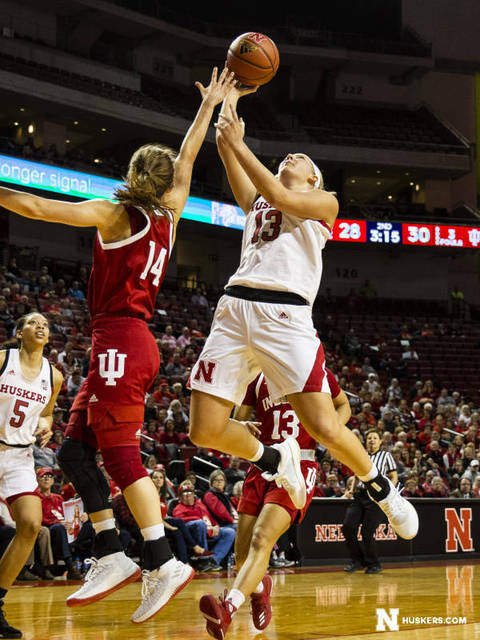 Sam Haiby scored 17 points and Hannah Whitish added 16, but Nebraska could not overcome a double-digit third-quarter deficit in an 82-78 loss to Indiana on Sunday afternoon at Pinnacle Bank Arena. After building a seven-point lead in the first quarter, Nebraska fell behind Indiana by 12 points late in the third before rallying in a possession-for-possession game throughout the fourth period. Trailing 58-46 with 2:30 remaining in the fourth quarter, the Huskers rallied to tie the score at 65 and again at 68 with just over four minutes left, but Indiana made enough plays down the stretch to escape with a victory. Nebraska slipped to 5-6 in the Big Ten and 10-12 overall. The Huskers are 1-5 in conference games decided by two possessions or less after playing their 10th game of the season decided by six or fewer points. Indiana improved to 17-6 and 6-5 in the league by improving to 5-4 on the year in two possessions games. Haiby, a freshman from Moorhead, Minn., got her 17 points on 5-of-8 shooting from the field and a 7-for-8 effort at the free throw line, while Whitish notched her sixth consecutive game in double figures with 16 points on 6-of-12 shooting. She was also 3-for-6 from three-point range. Senior Maddie Simon gave the Huskers a spark off the bench by scoring all 12 of her points in the second half. She scored 10 points in a 7:26 span to help Nebraska erase Indiana’s 58-46 lead to tie the game at 65 on Simon’s three-pointer with 5:42 left. Simon also led the Huskers with seven rebounds and two steals. Sophomore Kate Cain added nine points, six rebounds and two blocks for the Big Red, while Taylor Kissinger pitched in eight points, three boards and two assists. Ali Patberg led Indiana with a game-high 22 points on 8-of-12 shooting, including a three-pointer with 3:59 left that gave the Hoosiers the lead for good at 71-68. Patberg. The junior guard also sank 3-of-4 free throws in the final 30.6 seconds to help IU seal the win. Jaelynn Penn pitched in 20 points and five rebounds, before fouling out with 30.3 seconds left. Penn scored five straight points, including a three-pointer, to push IU’s lead to 76-70 with 2:06 to play. Senior Kym Royster contributed a double-double for the Hoosiers with 19 points and a game-high 14 rebounds. Royster went 7-for-8 from the field and 5-for-6 at the free throw line, including Indiana’s final point of the game with eight seconds left. As a team, Indiana hit 46 percent (29-63) of its shots from the field, including 21-of-34 (.618) combined in the second and third quarters. The Hoosiers finished 6-for-18 from three-point range, including 6-for-14 in the second half, and sealed the victory by going 18-for-21 at the free throw line (.857) for the game. IU out-rebounded the Huskers 37-36, but Nebraska outscored Indiana 15-11 on second-chance points. The Hoosiers also won a tight turnover battle, 13-12. Nebraska hit 44.3 percent (27-61) of its shots, but just 4-of-22 threes (.182) against the Big Ten’s best three-point field goal percentage defense. The Huskers hit 20-of-29 free throws (.690) in the game. Nebraska got off to a solid start by jumping to an 8-2 lead and building the margin to 15-8 with a minute left in the first quarter. However, junior wing Nicea Eliely was whistled for her second foul with a minute left in the quarter. NU closed the first period with a 17-12 lead. The Huskers maintained a 25-22 lead despite sophomore center Kate Cain picking up her second foul early in the second quarter, but Indiana put together an 8-0 run over a two-minute stretch midway through the period to take a 30-25 lead. Indiana took a 36-32 lead to the locker room at the half by hitting 48.4 percent (15-31) of its first-half shots, primarily on mid-range jumpers and action to the rim. Royster led Indiana with 12 points on 4-of-4 shooting from the field, while also going 4-for-4 at the free throw line. Royster added six first-half rebounds. Patberg added eight points and four assists for the Hoosiers in the half. The Hoosiers hit 11-of-15 shots from the floor in the second quarter, after going just 4-for-16 in the first period. Nebraska answered by shooting 45.2 percent (14-31) from the field, led by 11 first-half points from Whitish, including the only two three-pointers of the half by either team. Kissinger added eight points at the rim for the Big Red. Indiana won the first-half rebounding battle 18-17, and the Hoosiers also won the first-half turnover war, 9-7. Nebraska returns to Big Ten road action on Thursday night when the Huskers travel to Michigan. Tip-off between the Big Red and the Wolverines at Crisler Arena in Ann Arbor is set for 6 p.m. (CT) with live national television coverage provided by the Big Ten Network. Free live audio will be available on Huskers.com from the Husker Sports Network.